A direct contact between astronaut Tim Peake, KG5BVI and students at PSU. Wittayanusorn School, Kho Hong District, Hat Yai, Songkhla, Thailand was successful Sat 2016-01-30 11:06:23 UTC 63 deg. PSU. Wittayanusorn School, established in 2005, is a Prince of Songkla University affiliated private high school in Hatyai, Songkhla Province, Thailand. The school serves approximately 1,200 students in 7th to 12th grade. The school's identity colors are blue and grey. The blue represents sustainability and grey stands for wisdom. The school motto is "wisdom brings lasting success and happiness". The guiding principle is "our soul is for the benefit of mankind". The desired characteristics of our students are "SMART+" which are referred to scientific mind, good manner, aesthetic appreciation, responsibility and reliability, teamwork, and +global citizenship. Green education is our school's uniqueness which focuses on education for sustainable development. PSU. Wittayanusorn School is dedicated to create an exceptional teaching and learning environment in which morality is emphasized, science and mathematics concepts are embedded. The school curriculum is designed to maximize each student's potential for critical thinking, intellectual curiosity, community involvement, and responsible leadership. Additionally, the school has been selected by the Ministry of Science and Technology to be one of the first four regional schools of the country to host a special three-year science classroom program for high school level, grades 10 to 12, according to the proactive human resources development project to upgrade the science and technology capability of the country. The selection of students with high ability in mathematics and science for the science classroom program is carried out by the Institute for the Promotion of Teaching Science and Technology and closely collaborated with Prince of Songkla University. Each student who passes the selection will be entitled to a scholarship from grade 10 onwards, and subjected to certain additional criteria, he/she will be eligible for a scholarship until he/she can complete his/her education up to a doctoral degree level. PSU Wittayanusorn School was accredited with the score 97.02% by the Office of National Education Standards and Quality Assessment on May 26, 2015. 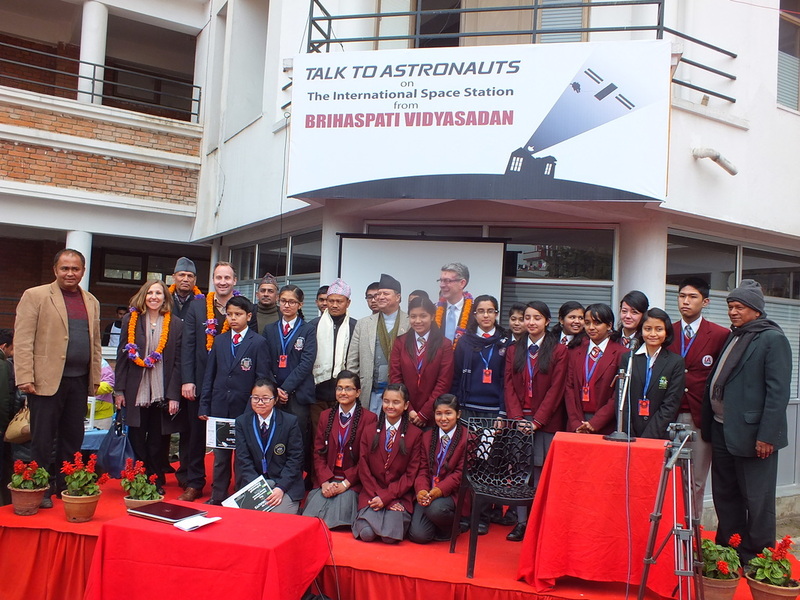 A telebridge contact via VK5ZAI with students at Brihaspati Vidyasadan, Kathmandu, Nepal was successful today at 08:37:04 UTC 26 deg. Astronaut Tim Peake, KG5BVI answered 17 questions for students. 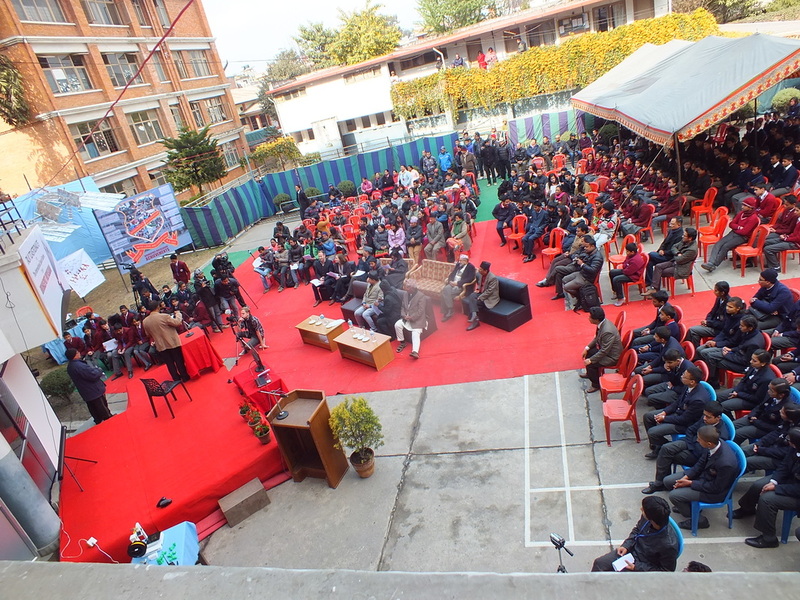 An audience of about 300 included students from 10 other schools, as well as the British Ambassador to Nepal, the Cultural Affairs Officer from the US Embassy, and a member of the National Human Rights Commission and former Ministry for Science and Technology. ​Brihaspati Vidyasadan is a 32 year old High school, located in Kathmandu, Nepal. Brihaspati runs classes from nursery to 100 at secondary level and the 10+2 program in Science and Management at the higher secondary Level. Besides these Brihaspati also runs Diploma in Hospitality Managemant and Tourism in affiliation with Confederation of Tourism and Hospitality (CTH), UK. Brihaspati is known for its academic excellence. To date Brihaspati has produced over 2000 SLC graduates and over 600 +2 graduates who have achieved excellent academic achievements. Brihaspati has also been awarded the "Best School in Nepal" in 2055BS. Brihaspati staff and students have been known for their innovation in education. 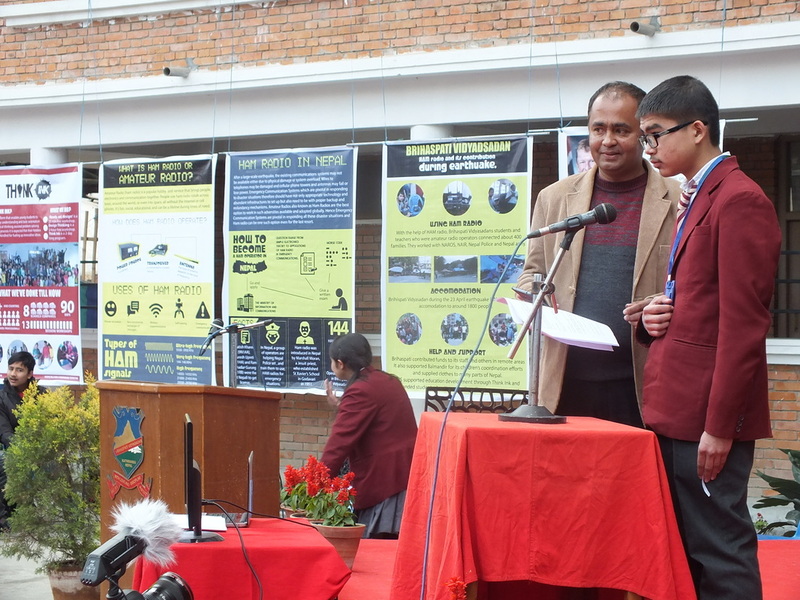 The school is reputed to be the first school in Nepal to introduce computer education. Brihaspati houses clubs like Lokopakar, which is a student club that looks into Humanitarian aid. Brihaspati students recently started gThink Inkh, an activity designed using the principles of Extreme Design from Stanford for instilling critical thinking and problem solving skills in students. This program has gained attention of a lot of people in the academia at a very rapid pace. Brihaspati is located in a 25 acre land space at the heart of Kathmandu within the Balmandir compound. It has academic facility that is of very high standards. It houses the Free and Open Source Research Lab and Ham (amateur radio) facility that students and staff have access to. A successful ARISS telebridge contact was held atScuola Secondaria di Primo Grado “Benedetto Croce”, Civate, Italy on January 13, 2016 through amateur ground station VK5ZAI in Australia. The astronaut for the contact was Tim Kopra, KE5UDN, using callsign NA1SS. 20 student questions were answered. There was an audience of 150 students, teachers, administrators and guests and the event was covered by a local TV station and newspaper. Audio of the event was carried by the amateur radio services Echolink and IRLP. The connection will be made telebridge mode, with the support of the Australian station VK5ZAI operated by Tony Hutchison. Add 4402 and 4403 and any other channels you require to your channel list. 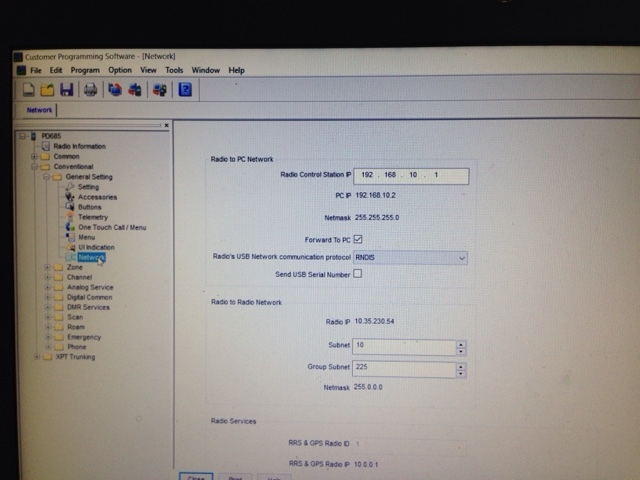 Now save your code plug and upload to your radio. Listen, to ensure no one else is using the hot-spot. If they are please join in say hello. This will force the hot-spot to connect to your chosen channel. 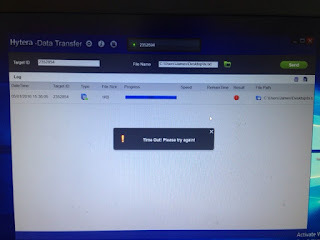 You are now connected and can use the hotspot on your chosen channel. M0JFP / Chetsey radio club. This is the end of the speeches and thank yous! A direct contact with students at Sandringham School, St. Albans, Hertfordshire, UK is scheduled for Fri 2016-01-08 08:47:47 UTC 83 deg. This will be the first ARISS contact associated with astronaut Tim Peake and the Principia Mission. An audience of 1300+ is expected. During the morning, the BBC will be devoting their live national BBC Breakfast news program to the pre-contact activities and the contact itself at the school. The BBC covered the event and posted these reports: http://www.bbc.com/news/science-environment-35261160 and http://www.bbc.co.uk/newsround/35261190. A video of the interview is available at https://www.youtube.com/watch?v=w-XF1GCz87g The video begins with the students of Sandringham School introducing their school and the activities that they have been involved with as part of their study into space. Another video includes an interview with one of the Sandringham students whose first contact as a radio amateur was with astronaut Tim Peake: http://news.sky.com/video/1619375/ringing-the-iss-from-school. Find more information about the Peake's Principia Mission at https://principia.org.uk/. The school is a specialist science college, arts college and leading edge provider. It is also designated as one of the first ‘World Class Schools’ in the country. The school operates a significant amount of community and outreach activities, is an Initial Teacher Training provider and runs a Teaching School Alliance for Hertfordshire. Sandringham is also a “Gifted and Talented” lead school and International School, with significant international activities taking place throughout the year. The school also coordinates National Initiatives with the Education Endowment Foundation and has a significant reputation in the country for delivering outstanding comprehensive education. The total number of students on roll is 1300 and expanding, with children from age 11 – 19, including a very large and academic sixth form. The catchment area is local, serving the needs of St. Albans and Wheathampstead although sixth form students join the school from further away if they meet the entrance criteria. We have over 100 teachers in the school including specialist teachers of computing science and three female physics teachers all of whom have a specialist interest in space and astronomy. In addition, the headeacher is a very active radio amateur who is extremely supportive of this contact. Make sure you choose 32 or 64 bit depending on your computers hardware. Fill in your name or call sign and put anything for company. 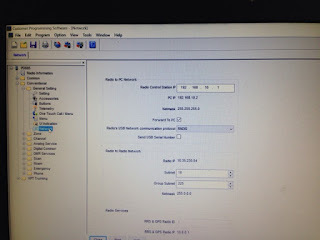 A telebridge contact via K6DUE with students at Frederick W. Hartnett Middle School, Blackstone, Massachusetts, USA was successful Tue 2016-01-05 17:42:06 UTC 81 deg. Astronaut Timothy Peake KG5BVI answered 14 questions for students and an audience of 600. ​Frederick W. Hartnett Middle School is a vibrant school in the central Massachusetts town of Blackstone, adjacent to Rhode Island’s northern border. It houses sixth through eighth grades for the regional school district that serves the towns of Blackstone and Millville. This is a quiet, somewhat suburban to rural area where most town residents choose to remain to raise their own families. The major land-form in the area is the Blackstone River, which runs southeast through our towns. Because of this river, like many New England towns, these areas were prominent mill towns in the late industrial era, and our landscape is dotted with old mills near the river, many which have been re-purposed for factory work, storage or condo living. Our regional school district has two elementary schools, one middle school, and one high school. Our ten-year-old building was built to keep our students up-to-date with technology. We are proud to say that we have 5 computer labs and a STEM program for each grade. It is our sixth-grade students who will be asking the questions to the chosen ARISS astronaut. Sixth graders have just completed an extensive set of lessons about the ISS, its mission, the country partners who sponsor and keep the ISS going, its components, astronauts, some of the science happening on board, and a little bit about astronaut training. Earlier in the school year, they learned about our Universe, its history, the formation and the lives of stars and galaxies, our Sun and its solar system and Earth’s place in all of this. Students are very excited to have this opportunity to speak with an ISS astronaut. In our classes, we often follow the path of the ISS, and we watch the Earth from the High Definition Earth Viewing System (HDEV) cameras placed on the ISS. We watched today’s Soyuz TMA-19M launch and ISS docking, bringing the three new crew members for Expedition 46. We have also had some very successful ISS viewing parties where students returned to school with their parents after dark to view the ISS when it passed overhead. We know you astronauts can’t see us, but we waved anyway! Thank you ARISS, NASA, ESA and all the ISS partners, our ARISS helpers Charlie Sufana and David Taylor, and all the astronauts who have participated in this great program which gives so many students a glimpse into and a personal connection with the science of space exploration and communication, on Earth and in space! ​Frederick W. Hartnett Middle School is a vibrant school in the central Massachusetts town of Blackstone, adjacent to Rhode Island’s northern border. It houses sixth through eighth grades for the regional school district that serves the towns of Blackstone and Millville. This is a quiet, somewhat suburban to rural area where most town residents choose to remain to raise their own families. The major landform in the area is the Blackstone River, which runs southeast through our towns. Because of this river, like many New England towns, these areas were prominent mill towns in the late industrial era, and our landscape is dotted with old mills near the river, many which have been repurposed for factory work, storage or condo living. Now write the code plug back to the radio. 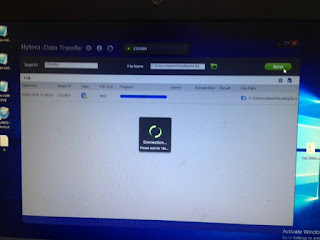 Open data transfer app and wait for it to detect the radio, see the green dot in the middle of the picture above with the radio ID number. In Target ID you will need to type in the ID of the radio you want to sent a file to, they will also need to be connected to a PC with this application running. 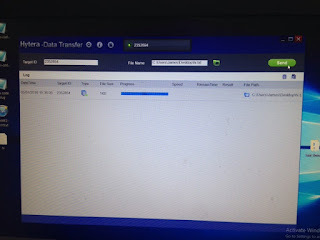 Choose your file by clicking on the green folder icon, note file size must be under 500K, I created a small txt file for this test. To transmit the file, click on send, you should now see the Radio transmitting. 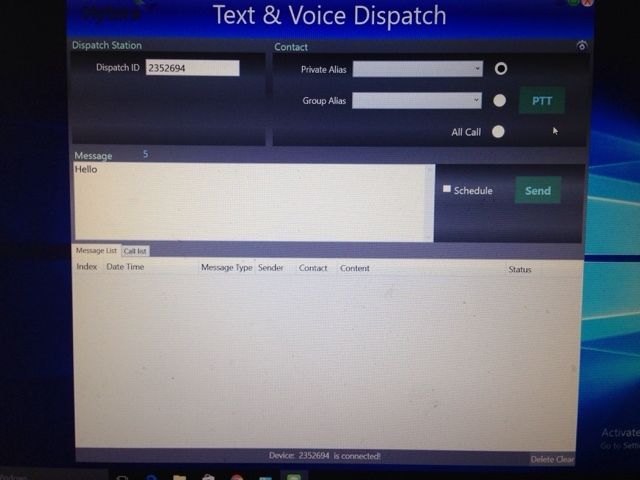 At this point as I do not have another radio to test with the application timed out, but I did see the radio TX several times. For this one to work one radio needs to be attached to the PC, the other radios just need to be in range. 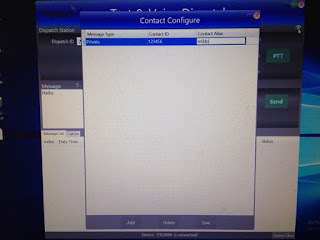 Click on Contact configure, which is the small cog up on the left see image above muse is pointing to it. In here click on Add, set message type as private and put in the radio ID you wish to send a message to. In contact alias put a call sign or name. In the message window you can send text up to 255 characters, in this example a quick hello is going to be sent. To send the message click send as shown in the image above. The message list should now the message as sent, you will see here as I don't have a second radio the text message failed.